Drifting away my perception changes. I can only recognise parts of what I do, see, hear and experience. Only in a quiet, secluded environment can I enjoy this state of dizziness, because I can deliver myself into it. My soul is impatient with itself, as with a bothersome child; its restlessness keeps growing and is forever the same. Everything interests me, but nothing holds me. I attend to everything, dreaming all the while. To feel well in chaos can mean nothing other than to integrate the uncanny, the incommensurable and unviable dimension which it represents into one’s way of living. Out of focus, I cannot finish what I begin, constantly starting anew and/or continuing with other half-finished things. These times find me concerned. All is blurred. I am not sure of who I am, of what I see, feel and think, of the quality of what I do. I am incessantly immersed, but I do not know in what. From experience I know this is a productive, even necessary state of being, although a lot appears and disappears again. I cannot distinguish anymore, the levels of intensity suitable for a certain person, context and work are opaque. I feel concentrated, confused, absorbed, vulnerable and sometimes helpless. Drifting away my perception changes. I can only recognise parts of what I do, see, hear and experience. Only in a quiet, secluded environment can I enjoy this state of dizziness, because I can deliver myself into it. Otto Antonia Graf, my art history teacher at the art academy once said in a lecture: Der Künstler ist in Ruhe zu lassen, in der Ruhe des Schaffens. (The artist is to be left in tranquility, in the stillness of creation.) Sure, but surrounding the artist is life. I do understand that this state of distraction provides me with the possibility to advance in my thought and work, but these periods are not very enjoyable to those closest to me, and therefore not always to me. I am not in control. In this mindset I miss, I lose, I intermingle, confuse, forget, merge, stir, break, I form. I am like dough in a mixer, multiple ingredients are constantly added, but I do not stand a chance of understanding how much of what and which kind of cake–if any­–is in the making. When I discovered experimental film as a student, I was taken by the mesmeric qualities of the unsharpened and out of focus pictures, such as in Stan Brakhage’s work. Their blurriness seemed apt to visualise this headless state of being. Synthesising seemingly unrelated objects and sights into a spinning movement of passing frames, was in my eyes, the visualisation of the mind’s flowing thoughts. As a child I thought it was only me that could not consciously watch my thoughts develop. Everybody else seemed so in control of their thoughts and of how their understanding developed… quite a misunderstanding. Apperception is a rare gift, I learn and reasoning is not the same as thinking. Now I see a similar headless behaviour develop in my son. When I propose a walk in the park he declines but proposes to stay in the area of the park’s playground. “I need a certain place to develop uncertain thoughts.” He says. 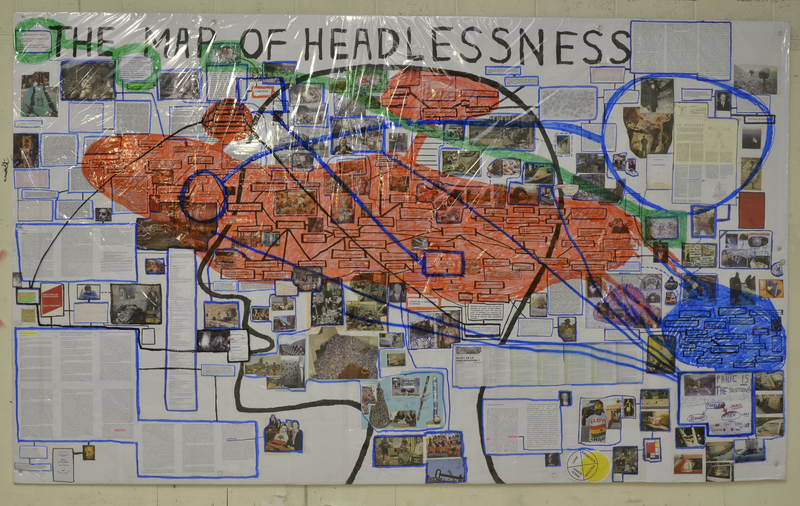 Headlessness is a term coined by artist Thomas Hirschhorn and philosopher Marcus Steinweg. (See: Map of Headlessness) In this text I interpret headlessness as being an alert distractability, or an all consuming alertness.